As before, I’ll discuss each in turn, looking at technologies we can use to make them happen. Relatively frequent stock checks have become essential across the entire factory because significant discrepancies can accumulate between volumes recorded in the ERP system and the physical volume of raw materials held on site. As a result, the minimum stock thresholds set for the warehouse by manufacturing resource planning (MRP) systems are typically higher than necessary. The MRP managers want to ensure there are enough materials to cover any re-order lead times in the additional context of materials that may be ‘lost’ between physical stock checks. As a result, customers’ requests for changes to delivery schedules are sometimes deemed impossible to meet because of the high risks associated with the unknowns around physical material availabilities. Then, there is the heavy workload involved in removing and/or reallocating kits of materials. The PCB test-and-analysis regime has been developed to address defects that occur as a result of production processes gradually or suddenly going out of control. Let’s say, for example, that there is a change in the material supplier. Although the new company may be qualified to supply under a common internal part number, the switch can cause a sudden increase in placement errors if there is just a small difference in, perhaps, height. Machines’ visual detection algorithms can often detect these problems, which is good in terms of reducing placement errors but also results in an ‘invisible’ spoilage of materials at the machine. 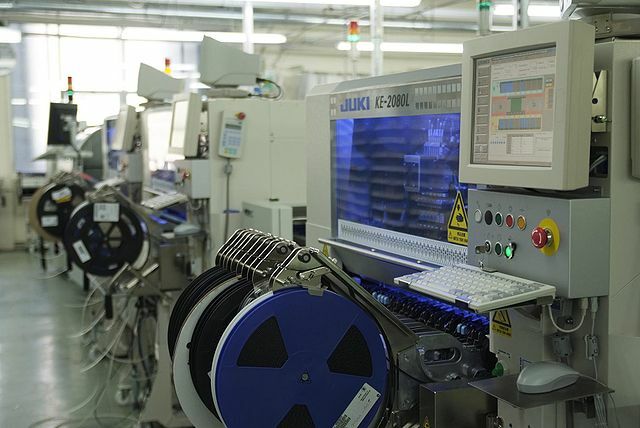 Because of the complexity of SMT-based PCB manufacturing, different teams must assume different roles across the flow, each with different motivations and incentives. The performance of each team is measured in different ways. This can lead to boundaries (or, commonly, ‘silos’) being erected between various competencies, and a situation where operators, engineers and managers may work well within their own specialities but do so far less efficiently at the boundaries of their responsibilities. As a result, some problems can go unaddressed because a solution is perceived to entail more cost than simply ‘letting it go’. Initiatives within or from one team may have detrimental effects on others, and come to be seen as little more than ‘flavor of the month’ improvements. They can also quickly lose their attraction once attention becomes focused elsewhere. This limits real improvement and results in far too many missed opportunities. In a manufacturing environment built around a common PCB manufacturing software infrastructure, everyone has a consistent view. Diverse information from different parts of the operation is qualified, accurate, and timely. Everyone gets the same information from the same source, but tailored according to each particular group’s competences. This enables different teams to work more effectively together, avoiding differences of opinion. Everyone can work toward a successful conclusion. The challenges that PCB manufacturing faces are not new. However, the complexity of today’s products and manufacturing processes mean that they can be much greater in both their scale and impact. That highlights a now compelling need for change. Volatility in customer demand is an inevitable by-product of consumers’ increasing influence on the high technology economy, and also our need for more energy-efficient devices. In addition to their complexity, today’s ‘core’ products actually tend to have many more variants and shorter life-cycles. All this requires that factories adopt a step-change improvement in the flexibility of their operations. Michael Ford is Senior Marketing Development Manager in the Valor Division of Mentor Graphics. Having majored in Electronics, Michael started his career with Sony, gaining a combination of hardware, software, system architecture and manufacturing skills, leading to the creation and management of Sony’s global Lean Manufacturing solutions in Japan. Since joining Mentor Graphics in 2008, Michael has become a key contributor to thought leadership in the industry, predicting trends and bringing insights on opportunities that can be gained by customers, driving the evolution of manufacturing execution technologies to deliver direct business benefits.